Doric Lodge are delighted to be able to donate the £500 to the friends of Ysgol Grug Glas. Ysgol Crug Glas is a successful special school situated in the heart of the city of Swansea, and the donation will go towards a fund to refurbish a therapy pool. The following Doric Brethren and Companions have recieved Provincial appointments and Promotions. 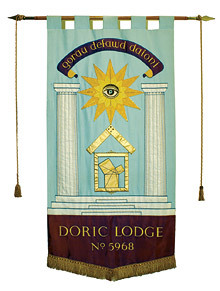 On Tuesday 3rd March 2015, as part of the Regular meeting, Doric were proud to be presented with 27 Festival Jewels to mark the donations of the Lodge to the festival so far. Three of the Jewels were presented to W.Bro Steve Lewis, W.Bro Ray Cope and W.Bro Mahmood Poptani, with the remaining Jewels presented to the Lodge to be distributed. The 2021 festival appeal was launched on 22nd January 2015, at Hendre Lodge by Festival President Provincial Grand Master RW Bro Gareth Jones OBE.